This 50th issue coincides with the publication on 7th September of our latest book, Gibraltar: The Greatest Siege in British History. It also coincides with Gibraltar’s National Day on 10th September, which this year marks the 50th anniversary of the 1967 referendum, the first time that Gibraltarians were given the choice of retaining their link with Britain or coming under Spanish sovereignty. They decisively chose to remain British. Another key event is that 2017 is the 300th anniversary of the birth of George Augustus Eliott – the Governor of Gibraltar throughout the Great Siege. 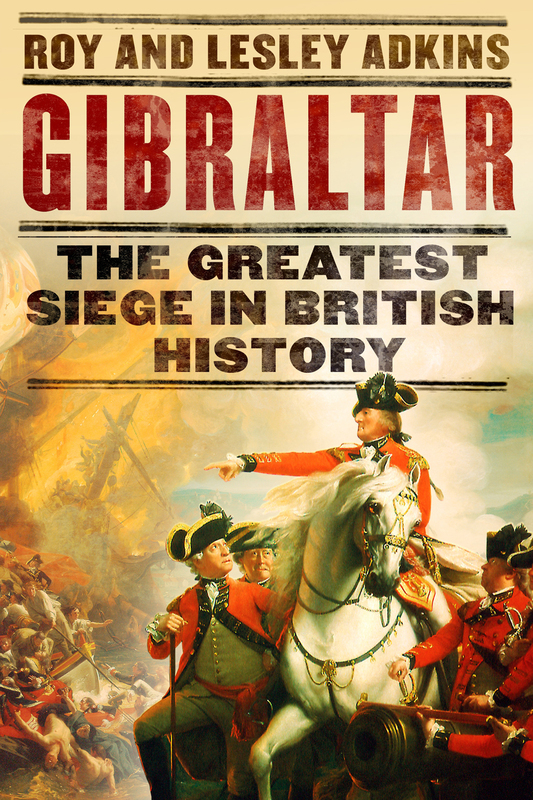 In the UK, Gibraltar: The Greatest Siege in British History is published in hardback (ISBN 9781408708675). It is 449 pages long, plus a prologue, black-and-white and colour plates, and several maps. It is also available as an e-book in various formats, and there is an unabridged downloadable audiobook produced by Hachette Audio. The narrator is John Telfer, no less – the acclaimed actor who is best known for his role as the Reverend Alan Franks in the long-running BBC radio drama ‘The Archers’. We have been listening to the audiobook and are smitten! It is beautifully narrated, bringing the text and characters to life in a way we would never have thought possible. Details on buying the different versions of the book are here. We do appreciate lovely jackets, and Gibraltar is surely a contender for an award. Designed by Nick Castle, it is based on a huge oil painting by the American artist John Singleton Copley, commissioned by the City of London in 1783. Today, the painting hangs in London’s Guildhall Art Gallery. On the left, Copley depicted Royal Navy boats rescuing French and Spaniards as their floating batteries burn and blow up, while on the right he painted high-ranking officers, including George Augustus Eliott on horseback. On the front of the book jacket, Eliott is pointing to the heroic rescue, and between his horse and a cannon stands William Green, the chief engineer. On Eliott’s right is the deputy governor, Robert Boyd, and tucked behind him is Major-General de la Motte, who commanded Hanoverian German troops, a reminder that the Great Siege did not solely involve French, Spanish and British troops, but many from other nations. The back of the jacket has almost the entire group of officers from Copley’s painting, who are all named in his original exhibition catalogue. Book lovers, take note – we have gorgeous endpapers as well. The endpapers are at the beginning and end of a book, half pasted to the cover, and are very often left blank, but they can turn a book into a desirable object. Our book is therefore worth buying for the endpapers alone! The artwork is a print of the famous sortie in November 1781, drawn by the artist and engraver Antonio Cesare de Poggi. From August 1783, he spent 10 months on Gibraltar, and the drawing itself took him 8 years to complete. It is a remarkable bird’s-eye view, with smaller scenes beneath, and to accompany its publication in 1792, he asked John Heriot to write a narrative, An historical sketch of Gibraltar, with an account of the siege. Heriot’s main source was John Drinkwater’s book on the siege, but he also had access to several unpublished documents, making his own publication invaluable. In the United States and Canada, our book will be published in hardback by Viking in March 2018 (ISBN 9780735221628). There is a different (but equally wonderful) jacket design, which you can see on our website and will be featured in a later newsletter. This entry was posted on September 5, 2017 by adkins.